So why is this paella recipe not authentic? Well…. I guess sometimes you have to work with what you’ve got and I really wanted paella for dinner! And even if it’s not technically paella it still makes a delicious rice dish! 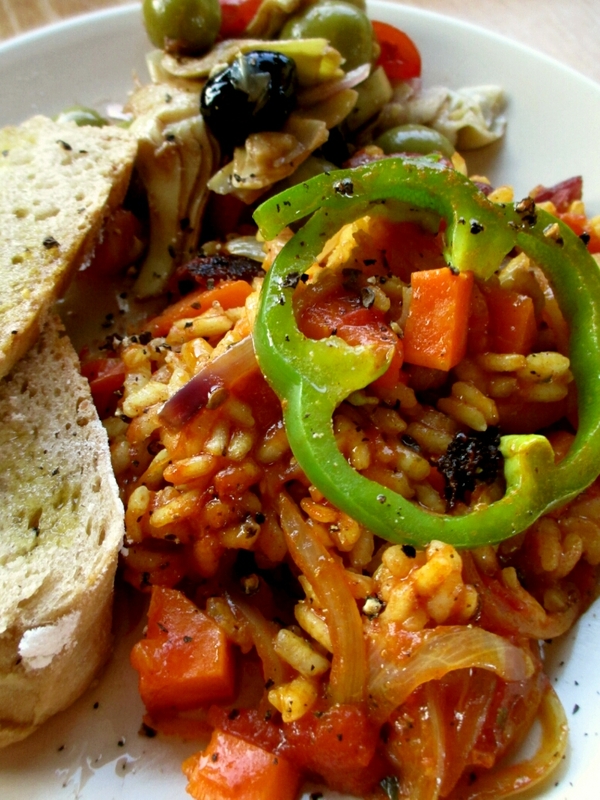 Serve this rice with some crusty bread, salad and maybe some sliced vegan chorizo or crispy seitan strips and enjoy! Heat olive oil in a large wok, high sided frying pan or even better if you have one- a paella pan. 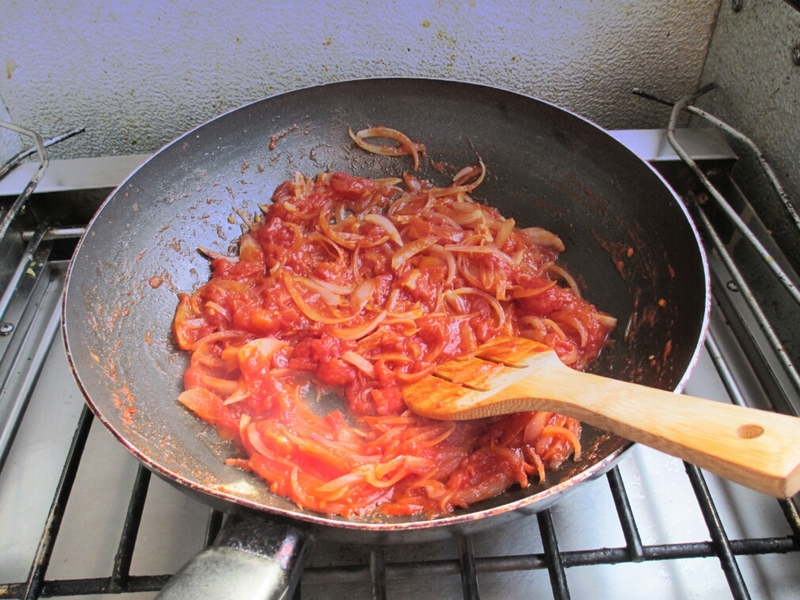 Add sliced onion and cook on a medium heat until soft. Add the can of diced tomatoes and turn up the heat high. 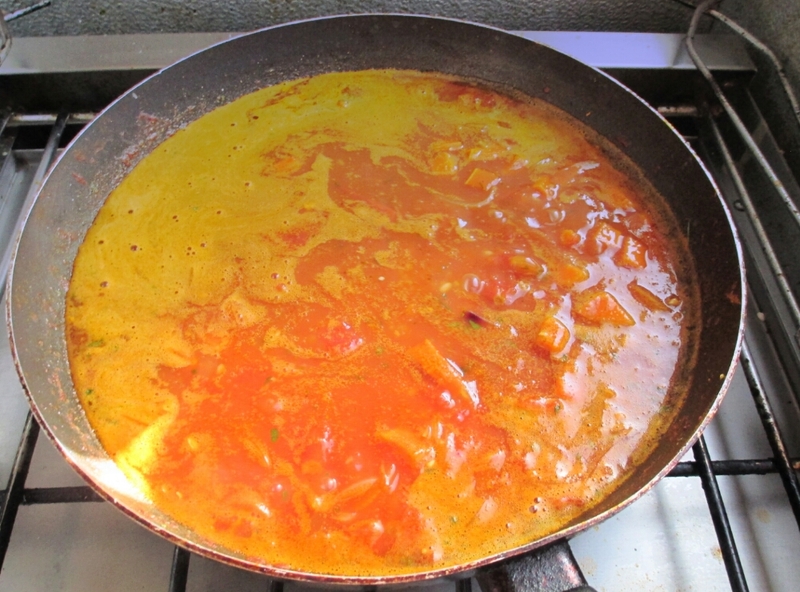 Stirring often, heat the tomatoes until the liquid reduces and they turn thick and paste-like. This takes around 10 minutes. Next add the garlic, carrots, green beans, kidney beans, salt, pepper, herbs, spices and broth and bring the mixture to a boil. Once boiling sprinkle in the rice, ensuring you spread it around the pan evenly. DO NOT STIR. You can put away your spoon as there is no need to stir this dish anymore. Boil for 10 minutes half covered, then reduce heat to a simmer. Arrange the sliced green peppers over the top of the rice and let simmer half covered for 10 more minutes. Check how cooked the rice is after about 5 minutes. You want nearly all the water to be soaked up so you are left with a dry-ish rice dish. Don’t worry if you think the rice is sticking and burning on the bottom, that’s the best bit! Turn off heat when rice is cooked and let it sit for 5 minutes before serving. Hi! This looks super good! At what point do I add in the broth?